Well it's my son's 20th birthday on Sunday, so I decided to make him a card. Unfortunately I made one then another idea popped into my head so in the end I have made him two haha. 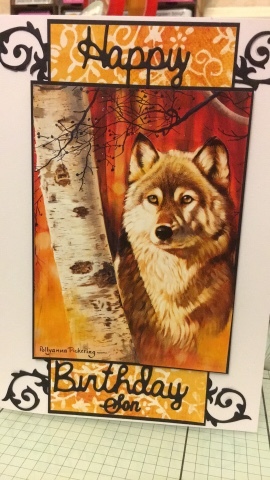 The 1st one is made with Pollyanna's Walk in the wild paper kit, using the wolf image. I used white card and black card from creative crafting world. Backing paper and large decoupage image from the paper kit. The flourish and birthday sentiment and son is from Crafter's Companion website. 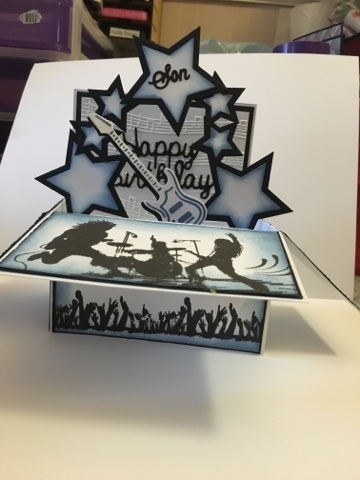 I used white card stock and made it into a pop up card. Black card to make it pop. I stamped the images and used Tim Holtz distress ink, Faded Jeans and inked the edges. 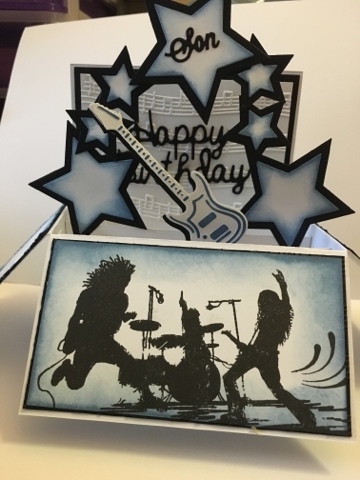 The stars and also the guitar, and the happy birthday sentiment. And the son die is from the only words die'sire die.